The 2012 evaluation of Danida Fellowship Programme recommended that the Ministry of Foreign Affairs should formulate a new policy for the programme. This work is currently taking place – and in that context, we have asked Jeef Bech Hansen to reflect on changes in the programme over the years and what the future could hold. This was the question that one of the participants posed Jeef Bech Hansen during his latest course ‘Public Sector Leadership’ and it may at first seem like an accusation towards the course and the one who developed it. The next question ‘How can I get in touch with him and learn more about the process?’ shows, however, that the scholarships encompassed in the Danida Fellowship Programme (DFP) have developed positively since the beginning of the ’90’s. Jeef Bech Hansen has, as course manager and facilitator, witnessed this development at close range. He is one of the people in Denmark who holds the longest experience working on DFP assignments. “Previously, it was an eye-opener for the participants to experience how we do things in Denmark. As the participants have moved on from an educational Bachelor-level to being very resourceful Master- level graduates, who have been to Europe and the US several times, they are more reflective and critical towards the concepts and approaches which have been developed in Denmark,” says Jeef Bech Hansen. According to Jeef Bech Hansen, it is the intentions in the Paris-Declaration which have shone through to today’s Danida fellows. “As they have become increasingly capable of managing their own work and they have gained insight into values and ideas from abroad, an increasing self-awareness has taken place. This indicates that a ‘South ownership’ has manifested itself,” he says. Jeef Bech Hansen acknowledges that Danida Fellowship Centre (DFC) has supported this development as they simultaneously have designed the courses to have a more reflective and conceptual approach. In terms of moving the geographical location for the courses from north to south, Jeef Bech Hansen reckons that DFC has made a great effort. Apart from adapting this, more innovative approach, Jeef Bech Hansen thinks that DFC should be recognized for having and utilizing the cultural understanding which is necessary for appraising the potential for future collaborations with STIs. As an example, Jeef Bech Hansen points out that it is not enough just to look at the training institutions’ vision and mission; It is also important to look at the ownership and whether there is support at management and facilitator level to engage in DFC-supported courses as they are often extra courses which are added to the institution’s regular tasks. On a more practical level, it is important to find out if the work procedures and salary systems allow the staff to engage in DFC-supported courses. This requires an understanding of the culture and how the organizations work – and there are only DFC’s three training advisors who can determine this and start up the processes which ensure that the STI is able to handle the courses in the future. “This is a very intensive process and DFC has been very good at it,” says Jeef Bech Hansen and underlines that the effort must be considered in the light of the fact that DFC operates on a funding of 40 million DKK out of a Danish support scheme which can be counted in billions. “If you look at how many courses DFC offers in the south today, you will find that they have come a long way for relatively little money. DFC must, however, maintain its close bond with the STIs as the DFC courses is only a small part of what they do. If DFC does not continually have a friendly and clarifying dialogue with them, there is a risk of the courses dying out,” he says. “It must be avoided that the participants return to a void because the rest of the organization is not yet ready for change. Also, there is a risk that the best employees – the ones who can drive the change – will be held back as they are viewed as potential threats to their superiors”. Basically, a successful training course depends on the preparatory work and in this respect Jeef Bech would like capacity analysis to be used. Formally, Danida demands that a capacity analysis always takes place in relation to sector support. That rarely happens though. Who is Jeef Bech Hansen? Jeef Bech Hansen holds degrees in Organizational Learning Processes and in Educational Planning in Developing Countries. 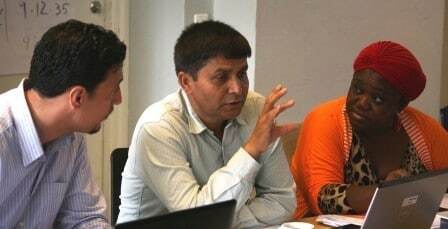 For almost 20 years, he has been involved in Danida Fellowship Programme (DFP) activities as a consultant, facilitator, and manager of learning programmes. Thus he has developed a unique in-depth understanding of DFP and of DFP learners. His experience covers appraisal, evaluation and reviews of capacity development programmes including organizational and institutional assessments; educational analysis and planning; and, formulation, management and evaluation of international institutional, organizational and human resource development interventions. He has worked in more than 20 countries in Africa and Asia for a large number of different clients and held positions at Aarhus Technical College, Rambøll and Copenhagen Development Consulting. Apart from having his own consultancy Capacity Trust, Jeef Bech Hansen is currently employed as Professional Manager at Civil Society in Development (CISU).